Data from Statistics Canada suggests that police in Newfoundland and Labrador are no longer charging people for simple possession of marijuana. 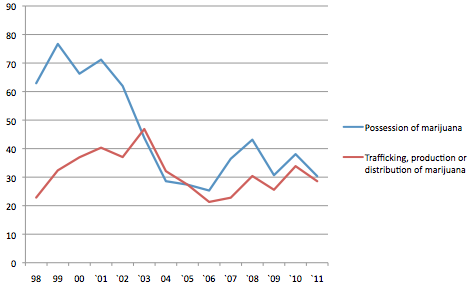 This contrasts with national data that show simple possession charges rising. The following charts shows rates of marijuana charges per 100,000 population. 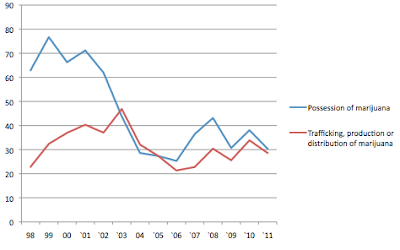 The blue line is charges for possession and the red line is charges for trafficking, production, or distribution. Since most people charged with a more serious marijuana crime are probably also charged for possession, the gap between the lines gives a measure of charges for simple possession. 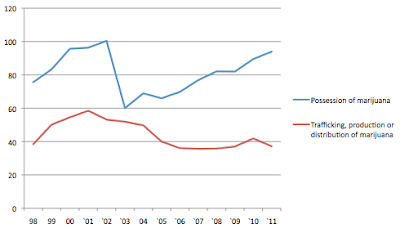 Since about 2003, charges for possession in NL have barely exceeded those for more serious violations, and fell slightly below in 2003 and 2004. 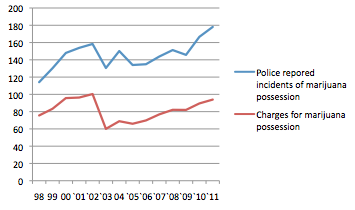 In contrast, the rates of possession charges in Canada have been growing steadily since 2005 while rates for more serious charges have held steady. 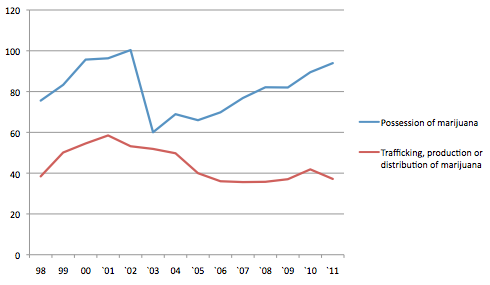 I suspect the fact that Stephen Harper became prime minister in 2006 has something to do with this. Another check is to compare police reports of possession violations versus charges for possession. Here are the rates. We see that in Canada possession charges have grown at about the same rate as reported incidents, while in NL reported incidents have surged while charges have not. My guess is that in about 2003, there was a decision made to not charge people for simple possession and police stopped reporting incidents of simple possession. 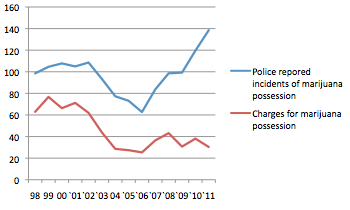 Then around 2008 police started reporting possession even if they do not press charges and incident rates jumped back to trend.